Every day is your career in miniature. Any minute could be a marquee moment. If you want to win, you need to bring your best to every engagement. Almost everyone survives somehow. Only the best thrive. They are the champions. They prove their superiority and they encourage others to excel. Like a train has track, champions have a checklist. It focuses them while it sets them free. Mike Lipkin calls himself “The Championator”. He studies champions for a living. He is one the world’s most sought after personal coaches. His mission is to literally turn people into champions. 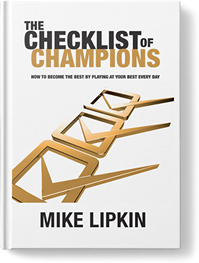 In this remarkable book, he shares his proprietary Checklist of Champions with you.It’s a daily formula for high performance that will help you identify, dream, plan, feel and play like a champion. You may be a heartbeat away from being #1. Or you may have miles to go. If you want to be the best, no matter where you are, this book is for you. It contains dozens of insights that are scientifically proven to boost your impact and influence. It will show you how small, simple acts can produce huge breakthroughs.